I often find that most vegetarian versions of meat dishes such as vegetarian sausages, nut roast fall way short of their carnivore counterpart and I’d much rather have a tasty classic vegetarian dish than a meat substitute one. 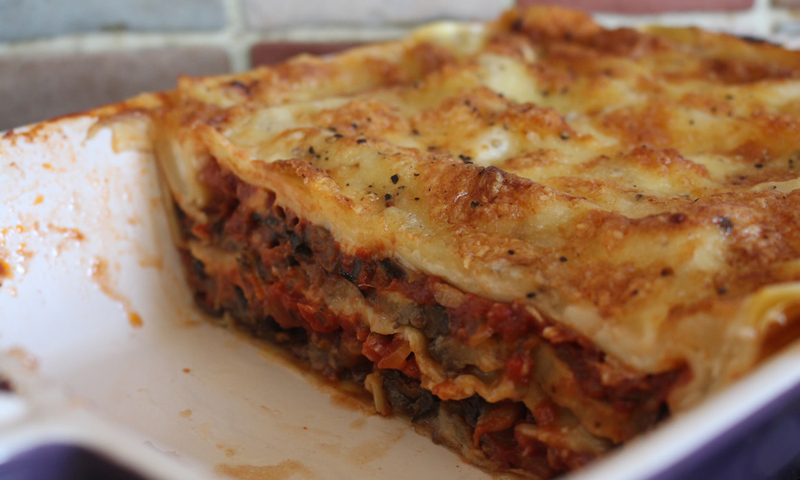 Saying this I think that a vegetarian lasange is just as good if not sometimes better than the meat lasagne. 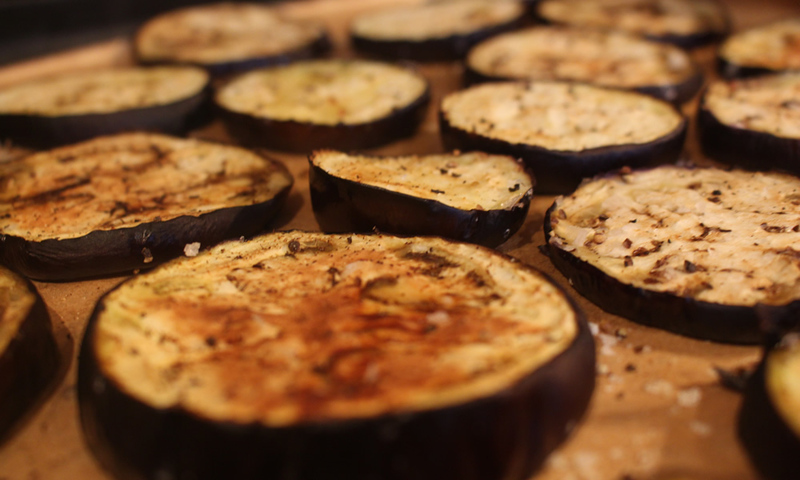 My version uses roasted sliced aubergines and mushrooms, but you can use this recipe as base recipe and experiment with your own favourite veggies. First slice the aubergine about 1cm thick and lay them on a baking sheet, drizzle with olive oil and season with salt and pepper. Bake in the oven for 15 to 20 minutes at 180°C until starting to brown. Leave to cool and set side while you make the rest of the recipe. In a large pan sweat the onion in a little oil for 5 minutes over a medium heat, then add the mushrooms, garlic and herbs, cooking them for a further 4 minutes stirring occasionally. Add the chopped tomatoes, ketchup (if using), soy and tomatoes puree. Leave to simmer gently for half and hour to an hour to let the flavours develop. Taste and season with salt and pepper if needed. Meanwhile you can make the béchamel sauce. In a sauce pan and the butter and flour and cook togther on a medium heat. Once the butter has melted and stir to make a paste. Add a little of the milk and stir the butter and flour will act as a thickening agent. Repeat with add a little of the milk at a time until it is all used up and you have a nice thick sauce. Add the parmesan and a pinch of nutmeg, stirring through. Now it’s time for the assembly. In a casserole dish layer half of the aubergine in to a single layer and pour over half of the tomato mushroom sauce. Drizzle over a third of the béchamel sauce and layer over the lasagne sheets. Repeat the process for the second layer. For the top pour over the remaining béchamel and sprinkle all over the parmesan. Finally tear up the mozzarella balls and layer on top with a good grind of black pepper. Bake in an over at 180°C for 40 minutes. Serve with salad or just on its own.